DONKEY OTIE wasn’t always as you see him today. His life began the night Jesus was born after realizing he no longer was alone and scared. Loving Jesus meant he was part of a very big family. Donkey Otie knew immediately that he could introduce little boys and girls to Jesus especially if their moms and dads need to meet him, too. Donkey Otie wants to take your family on a journey beginning when he was just a young colt. He was a sad and lonely orphan so afraid of everything, unsure of who he was or where he was going … so he stuttered. 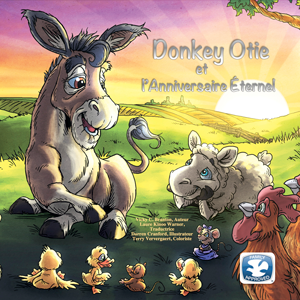 Then one day still shaky on his legs, his new master’s father gave Donkey Otie as a wedding gift to his son. Joseph and his betrothed Mary would need Donkey Otie for their journey to the family’s hometown of Bethlehem to be counted by the government leaders. Little did Donkey Otie know, while there more would be given birth than simply a baby whose name was Jesus. Everything in Donkey Otie’s life changed the night he met Jesus. Among other things, he no longer stuttered. Now he needs your help to tell everyone about loving Jesus. 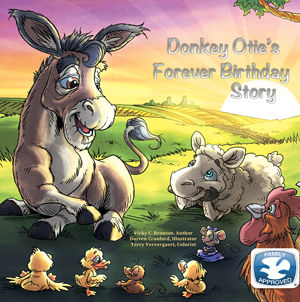 Enjoy exploring Donkey Otie’s Website as he shares His-story with the world! 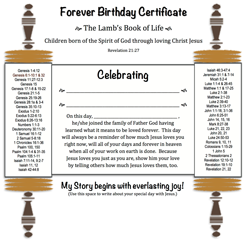 Soon you’ll find ways to tell others about the love of Jesus living in your heart … forever! I finished your script … and how can I say this: “I AM BLOWN AWAY!” The brilliance of what God has given you is far greater than what my heart could ever have imagined. Yes, I have read the book — Donkey Otie’s Forever Birthday Story; but this script takes it to another level. I was so drawn in and stuck to my seat that I let the music play (the songs you highlighted) as they was queued. I found myself closing my eyes and seeing the illustrations from the printed book come to life. Vicky, I felt like I was right there … AND in God’s presence. The simplicity, yet spiritual depth of this script is unlike anything I’ve read before. I thought to myself, “This is better than any Disney movie I’ve ever watched, and I’ve seen them all!” The quality is classic to me … like reaching back in time when movies, even cartoons, were classical and memorable. It was like I was there with Donkey Otie and his friends as you told his story. From a scribal perspective, God has TRULY placed His favor upon you with this script. It is OBVIOUS to anyone who loves Jesus that this is Him at work; yet, there are many, MANY messages here that all people can appreciate and draw from. The characters names prophetically came alive for me … as their actions in and of themselves affirmed so much from scripture and the heart of God. In short, I CAN’T WAIT FOR THIS MOVIE! What really captured me at the end, however, was how you pointed the people to the full story in the Word. That, I have never seen. TM & © 2019 Donkey Otie. All Rights Reserved. Designed by True Potential.